WASHINGTON — If you ask the U.S. Air Force chief of staff, capacity is key to the strategy for the service. And to achieve the right level of capacity to meet mission requirements, the service will need to rely on a perfect mix of aircraft. Gen. David Goldfein is quick to note, however, that acquiring multiple platforms does not detract from the importance of the F-35 fighter jet, but rather enables the Air Force to take fuller advantage of the jet’s capabilities as the command center of an extensive network of systems. 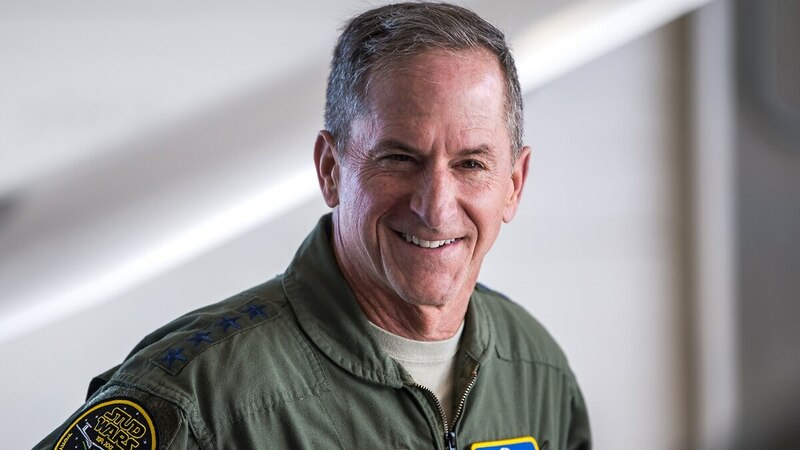 Defense News interviewed Goldfein while traveling with him in January to see the delivery of the first two KC-46 Pegasus planes to the Air Force. You’ve said that if the money is there, the Air Force could buy new and improved F-15 fighters, known as the F-15X. What does that mean for the F-35? First, you’re not going find a stronger proponent for the F-35 than the team here. As we look to the program of record, that program of record stands for 1,763 airplanes, and so we’re going to keep the F-35 program on track. If the budget is successful going through, you’ll see that we’ve kept the F-35 not only on track but we’ve actually added money for additional capability as we go forward. I’m not interested in taking a nickel out of it to buy anything else in the fighter portfolio. But here’s our challenge: To build the Air Force we need, we need capacity. And our analysis shows that needs to be 72 fighters per year to be able to drive average age down, to be able to recapitalize in the right mix [according to] the analysis we did on the fight against a peer competitor. So for me, the F-35 is part of this penetrating joint team. The JF-17 is under consideration alongside the Tejas, produced by India’s Hindustan Aeronautics Limited, and the FA-50 Golden Eagle, made by South Korea’s Korea Aerospace Industries. If an adversary ever sees the F-35, I want them to have something show up on all their screen savers that says, “We’re here” — not “I’m here,” but “We’re here.” If they ever do see an F-35, which is highly unlikely, it will never be alone. We’re going be there in space — we’ve been there for a while; we’re going to be there with high altitude, ISR; we’re going be there with the B-21. It’s about to wreak havoc, and there’s nothing they can do about it. And there’s one weapon system that we’ve designed to quarterback, to call the audibles inside enemy airspace, and that’s the F-35. It fuses information, it fuses data. For me, we are not going to integrate the F-35 into the joint team, we are going to integrate the penetrating joint team into the F-35. How does that end goal influence training? When I was a mission commander, when I went to school, my job was to choreograph aircraft into a robust enemy defensive network and go in and accomplish my mission. And we would do sort of visual time slices, and we would work this through as a team. I’d say: “OK, so at push time, 10:02, this is how the formation will look. At 10:05, this is how we will look. At 10:10, this how we look.” And we would all sit there and sort of memorize what the formation looked like, and then we’d go out and execute. But we just knew what was going on in our cockpit and what we were seeing. And our own real connectivity was through the radios. And then we’d come back and, through listening to radios and looking at radar tapes, the job of the mission commander was trying to figure out what just happened. What did we miss, and what did we learn and how do we get better next time? And it was great, a lot of fun, but it was a different skill set. So now in the F-35, with various displays and information fusion, that individual — as a mission commander — the first thing that she briefs is her space war-fighting crew. And when she’s done, all the space war fighters are saying: “OK, got it, I see my time slice.” And the next thing she does is look at all the cyberwarriors and she says: "OK, here’s my cyber plan, here’s all the key nodes you’re going after, here’s when you will go after them, here’s the time slice.” And then she’s looking at the different parts of the force, saying: “Here’s how it all works.” And then the force, as it executes, is all seeing each other. The weapons system that we designed to call the audibles — because nothing in war goes exactly as planned — is the F-35. So how we train the force in the T-X [trainer jet] to be able to get to that level of operation understanding is where we’re going. And it’s my experience that in the career of an aviator, what makes the difference between a really good pilot and a great pilot is not stick and run; it’s mental. Who can make the leap that can take all that’s going on and build this three-dimensional model in your head to understand what’s going on miles away from you, in a way that you can never see? We’ve made that easier by bringing these displays together to fuse the information. Why look at a new F-15? What’s wrong with your current ones? There are four weapons systems that we have to fly into the 2030s. The National Defense Strategy — it’s what it asks us to do. It’s clear that in each portfolio, in certain levels, we need to grow. And we looked at different force elements and different force sizes, different kinds of weapon systems working together. It became clear to us that we need capacity. Of those four weapons systems that we need to fly into the 2030s, as we build up size of the F-35 fleet, one of them is not going to make it, and that’s the F-15C. A-10s are going to fly in the 2030s, F-15 Eagles will fly in the 2030s, F-16 will fly in the 2030s. All our analysis says the F-15C’s not going make it. It’s structural, right. It’s an old airplane and getting older. It’s performed brilliantly, but the cost curves into a point where you’re spending so much money. I don’t know if you’ve ever driven an old car that dies in thousand-dollar increments. I have. It’s really painful. We have got to refresh the F-15C fleet because I can’t afford to not have that capacity to do the jobs and the missions right. So that’s what this is all about. I really can’t go into more detail because of the budgets. But it’s an important message that says that if we’re refreshing the F-15C fleet as we build the F-35 fleet, this is not about any kind of a trade. First and foremost we have got to keep the F-35 on track. But as I’m really excited about the KC-46, I’m also a pretty tough customer. Because every dollar that we spend is a dollar that some American earned. And we have got to make sure we spend that dollar wisely. The nation expects the chief and the secretary to be really tough customers. So we’re tough customers on the KC-46 and we’re tough customers on the F-35. There’s the question of quality versus quantity. Are you going to sacrifice quality with what you’re hoping to bring on? Not if we keep the F-35 on track. We have a broad range of missions that we use the fighter force for — we are going to be a mix well into the 2030s of fourth-gen and fifth-gen [fighters], and they complement each other. One plus one, fourth-gen plus fifth-gen, actually equals three [fighters] if they’re used correctly because they each make each other better. What we can’t afford to do is slow down our procurement of the F-35. We want to drive aircraft age down to about 15 years, as opposed to 28 years, which is where we are at now. To do that, you’ve got to buy 72 aircraft a year. If we had the money, those would be 72 F-35s, but we’ve got to look at this from a cross-business case. The F-15 will never be the F-35. But I need an asset. What’s going on with the light-attack program? We’ve been very consistent about the strategy from the beginning. First and foremost, this is all about allies and partners. The National Defense Strategy says that we’re going to invest and increase our relationships with current allies and partners, and build more allies and partners. And because so many are fighting violent extremism at their borders, this was our approach to say: “OK, how do we support the National Defense Strategy by building a weapon system?" The second thing is that as we build the Air Force we need, I have no place I can go within the United States Air Force to trade away capacity to build light attack. It has to be additive. It does do some things inside the Air Force that are very helpful, but it’s not a requirement inside the Air Force. This is a requirement for our allies and partners that we’re working towards. So given those two fundamental assumptions, we opened up to industry to this experiment. And I cannot thank the two companies that joined us enough for their partnership today because they’ve been extraordinary and we’ve learned a ton. Some countries may be better to have an unmanned option; some countries would be better to have a rotary-wing option; some countries want to do a fixed wing but turboprop; some countries want to do fixed wing but turbojet. So we were able to start experimenting with just one of those. So now what can we do to expand the experiment to look at, what is the right mix? And how do we bring allies and partners in right now with us — not just periodically parachuting in? For us to issue an RFP would set an expectation that we’re ready to go to selection when we’re still working our way through what the strategy would be. That would be, in my mind, a bit irresponsible. I talked to both the CEOs, and we want to make sure we strengthen the partnership we already built as we go forward.